Fever is scary to parents. Parents hear about fever seizures and are afraid the temperature will get so high that it will cause permanent brain damage. In reality the way a child is acting is more important than the temperature. If they are dehydrated, having difficulty breathing, or are in extreme pain, you don’t need a thermometer to know they are sick. Fever can make the body ache. It is often associated with other pains, such as headache or earache. Kids look miserable when they have a fever. They might appear more tired than normal. They breathe faster. Their heart pounds. They whine. Their face is flushed. They are sweaty. They might have chills. Fever is often feared as something bad. Parents often fear the worst with a fever: Is it pneumonia? Leukemia? Ear infection? Fever is good in most cases. In most instances, fever in children is good. It is a sign of a working immune system. Fever is often associated with decreased appetite. This decreased food intake worries parents, but if the child is drinking enough to stay hydrated, they can survive a few days without food. Kids typically increase their intake when feeling well again. Don’t force them to eat when sick, but do encourage fluids to maintain hydration. Fever is serious in infants under 3 months, immune compromised people, and in under immunized kids. These kids do not have very effective immune systems and are more at risk from diseases their bodies can’t fight. Any abnormal temperature (both too high and too low) should be completely evaluated in these at risk children. I hate to say it, but for many parents it is just not convenient for their kids to be sick. A big meeting at work. A child’s class party. A recital. A big game or tournament. Whatever it is, our lives are busy and we don’t want to stop for illness. Unfortunately, there is no treatment for fever that makes it become non-infectious immediately, so it is best to stay home. Don’t expose others by giving your child ibuprofen and hoping the school nurse won’t call. Fever is a normal response to illness in most cases. Most fevers in kids are due to viruses and run their course in 3-5 days. Parents usually want to know what temperature is too high, but that number is really unknown (probably above 106F). The height of a fever does not tell us how serious the infection is. The higher the temperature, the more miserable a person feels. That is why it is recommended to use a fever reducer after 102F. The temperature does not need to come back to normal, it just needs to come down enough for comfort. Fever is most common at night. Unfortunately most illnesses are more severe at night. This has to do with the complex system of hormones in our body. It means that kids who seem “okay” during the day have more discomfort over night. This decreases everyone’s sleep and is frustrating to parents, but is common. Fever is a time that illnesses are considered most contagious. During a fever viral shedding is highest. It is important to keep anyone with fever away from others as much as practical (in a home, confining kids to a bedroom can help). Wash hands and surfaces that person touches often during any illness. Fever is an elevation of normal temperature. Normal temperature varies throughout the day, and depends on the location the temperature was taken and the type of thermometer used. Digital thermometers have replaced glass mercury thermometers due to safety concerns with mercury. Ear thermometers are not accurate in young infants or those with wax in the ear canal. Plastic strip thermometers and pacifier thermometers give a general idea of a temperature, but are not accurate. Fever is rarely dangerous, though parents often fear the worst. 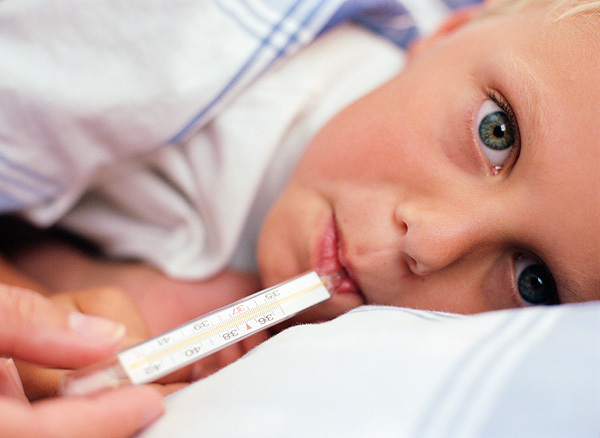 Use fever reducers to make kids comfortable, not to bring the temperature to normal. Have an electrolyte solution at home in case of vomiting. Teach kids to wash their hands and cover coughs and sneezes with their elbows. Stay home when sick to keep from spreading germs. It is generally okay to return to work/school when fever – free 24 hours without the use of fever reducers. Help kids rest when sick. If the fever lasts more than 3-5 days, your child looks dehydrated, is having trouble breathing, is in extreme pain, or you are concerned, your child should be seen. A physical exam (and sometimes labs or xray) is needed to identify the source of illness in these cases. A phone call cannot diagnose a source of fever. Any infant under 3 months or immune compromised child should be seen to rule out serious disease if the temperature is more than 100.5. She has a fever, her temperature is 99.2. Is It Normal? We have all grown up with the concept that the “normal” body temperature is 98.6 degrees Fahrenheit, right? Heck, it even says so on the old style glass thermometers, with a nice little arrow pointing right at 98.6—not that many of us use those glass thermometers any more (and no one should be using ones which contain silver-colored mercury) since ear and temporal thermometers have become so much more available and affordable in recent years. In fact, the normal body temperature is not one number, but a range, generally felt to vary between 97 and 100.4 degrees. And it varies predictably with the time of day as well. Called a diurnal (from the Latin for day) variation, we reach our lowest temperature in the early pre-dawn hours, and our temperature peaks about twelve hours later, in the late afternoon. This variation is hormonally controlled, and while the times of the peaks and valleys can be altered (by changing sleep patterns, for example), this variation, and range of normal temperatures is characteristic of all humans. So not only (as my colleagues have previously discussed) is fever not something to be feared, it is also something to be careful about even diagnosing. Consider that the temperature of a healthy, “normal” child might vary as much as three degrees Fahrenheit from the daily low to the daily high. And remember that, much more relevant that the number on the thermometer is the way that your child looks and acts. Is it “normal” for a baby to sleep eighteen hours out of twenty-four? Or for a toddler to seem as if he can get by on eight hours at night plus a couple of power naps during the day? The same answer applies to sleep as it does to fever—there is a wide range of what “normal” children require in order to function normally. And therein lies the true answer: A child is getting enough sleep if he or she is able to be awake and functioning normally for blocks of time during the day, if he or she is not always yawning or drowsing off during activities, and if the mornings are not a struggle to get the child awake and moving in order to get the day started. Look at your child’s general alertness—that will give the best clue as to whether or not the amount of sheep he or she is getting is adequate. It is very hard to define a “normal” amount of food and nutrition intake. Different children have different metabolic rates and activity levels, and children do not grow at the same rate every day. No one—not the doctor, not the parent, not the grandmother—knows better than a child just how much nutrition a given child needs on a given day. And normal children will not starve themselves—they will choose and eat the foods that their bodies tell them are needed for growth. Of course, they might naturally choose sweets or “junk” food, but I presume that, as parents, we will offer our children choices consistent with good nutrition, and allow then to choose types and amounts of foods from that selection. A parent’s job is NOT to get a child to eat; rather, it is to provide nutritionally sound choices from which the child can select those foods which his or her body needs at any given time. Once again, the same thing holds for bowel movements, especially in the newborn and infant period. There is no single “normal” frequency for an infant to have a bowel movement. As in so much of pediatrics, what is “normal” can often best be defined by what is working for a particular child, and not by comparison to what other children are doing or experiencing. I cannot emphasize strongly enough that if your baby or child is happy, thriving, comfortable and growing, and is able to function normally, the chances are good that whatever he or she is doing with regard to temperature, sleeping, eating or eliminating is “normal” for him or her. Listen to and watch your child—they are really good at letting you know if things are going well or not. Dr. Hackell is a founding member of Pomona Pediatrics PC, a division of Children’s and Women’s Physicians of Westchester. He practices in the lower Hudson River Valley just north of New York City.